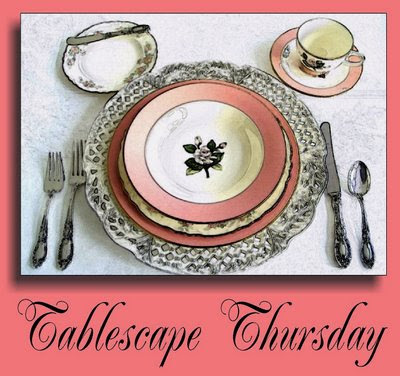 Welcome to Tablescape Thursday with our hostess with the mostest, Susan at Between Naps on the Porch. 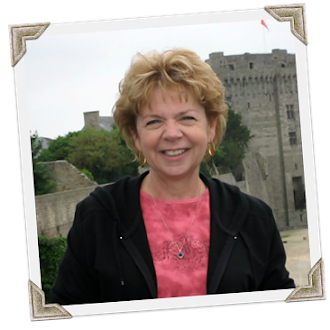 Be sure to drop by her wonderful blog to see a list of this week's participants and to be inspired by her fabulous tablescapes! This week, we are celebrating Mardi Gras since it will take place next Tuesday!! In honor of the occasion, Baby Kitty has decided to join in the festivities by donning his costume! And here it is...our Mardi Gras supper for two! I used the traditional Mardi Gras colors...gold for power, purple for justice and green for faith. 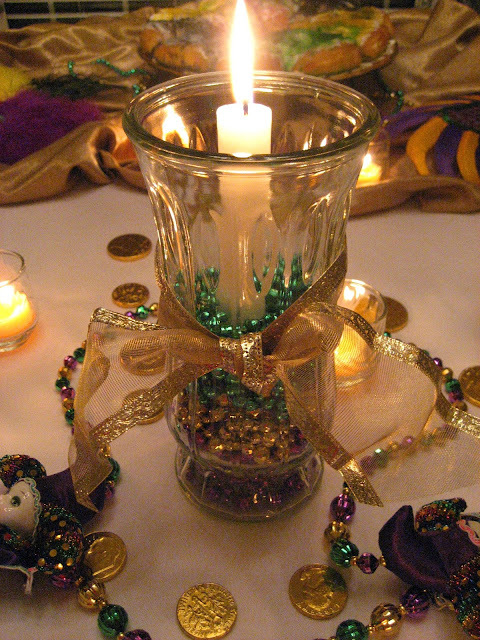 My centerpiece is a hurricane filled with layers of Mardi Gras beads surrounding a candle. I added some gold ribbon to help make it a little more elegant. I used two napkins, one purple and one green, to help carry out our color scheme. There is also a mask at each place. This one is my favorite! I tied the napkins with more of the gold ribbon and added little mask picks that I found at Kroger. 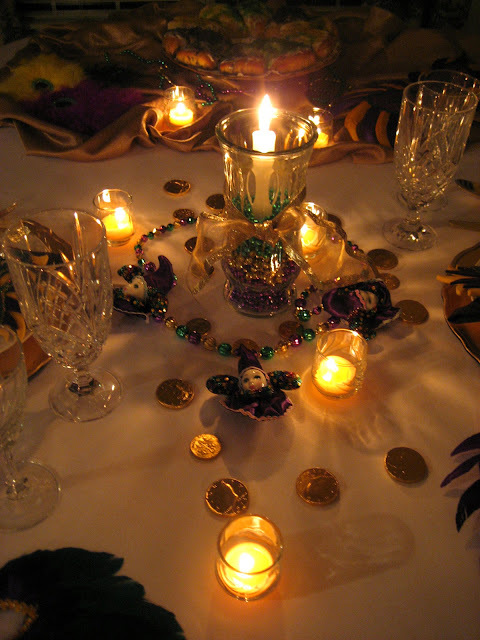 In addition to the center candle, I scattered several tea lights around the table along with my Mardi Gras "doubloons"...more about them later. I found this wonderful harlequin necklace at Party City. Hmmmm....once it is through being a centerpiece, I think it will be my official Mardi Gras necklace...so much more elegant than beads!! You must look elegant while you are whoopin' and hollerin'. I'm using my Irish crystal goblets beside my Goodwill wine glasses again. I think it helps my bargain finds look so much nicer! Here's a close-up of my harlequin necklace. Isn't it just so cute?? There are three of these on it! And...lol...you are seeing my secret! Those aren't Mardi Gras doubloons at all! Good luck finding those around here! They are foil-covered chocolate coins! Hey...they are gold and shiny and that works for me! Anyway...we can eat these later! You can't have Mardi Gras without a king's cake! 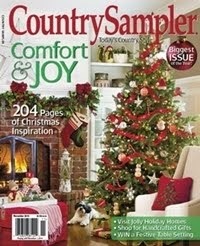 This one came from Kroger as well. I have added the traditional little baby. In French homes, there would be a king's cake on January 6th, the Feast of the Epiphany, which celebrates the Wise Men's visit to the baby Jesus. There, whoever finds the baby is king or queen for a day. Here, you buy the next king's cake... hmmmm...not so much fun! The gold fabric is actually a drapery panel I found on the clearance aisle at Ross. Well...now you have had a look at my Mardi Gras supper! Now that my king's cake is through being a centerpiece, let's dig into it! Did you get the baby?? Laissez les bons temps rouler!! Let the good times roll! Happy Mardi Gras!! I'll be doing a mardi gras table on Fat Tuesday...thabnsk for the inspiration. And the chuckle, I busted out laughing when I saw your cat in the mask. Too cute! I love it Debbie! 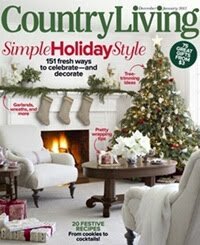 Great tablescape and photos! I second everything that has been said!!! 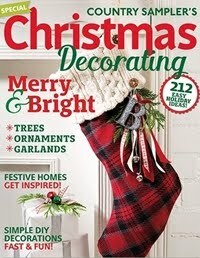 Very Festive!! I too laughed out loud when I saw that last kitty in her mask! Debbie, this is wonderful! You are just a scream! And the table looks great. 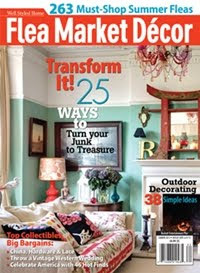 I think we must be leading parallel lives as T.J. Maxx is my favorite store, too. I like it better than Home Goods or Marshall's. Beautiful! And I can't wait for Fat Tuesday! I love your table! I made a Mardi Gras themed picture for Recipezaar this weekend and couldn't find my coins from New Orleans any where. Luckily, I have some green and gold St. Pat's Day coins that filled in!!!!! Your "secret" is as safe as mine! This was fun! 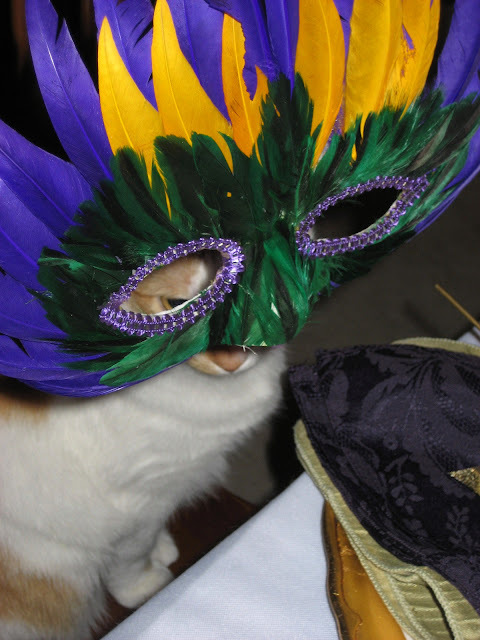 Your tablescape is beautiful and your little kitty of course looks fabulous :>) I am going to my very first marti Gras party soon and I'm very excited about it. I really like your idea of putting the beads in the bottom of the vase. Everything looks so sparkly. I just love it! Oh what a fun table Debbie! I really like it . Beautiful tablescape!! As a native Louisianian I can certainly appreciate the Mardi Gras style! Excellent job!! Happy Mardi Gras to you! 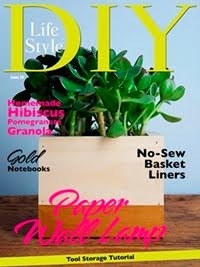 I'm always eager to see how you will decorate your table each week. Such a very pretty setting. 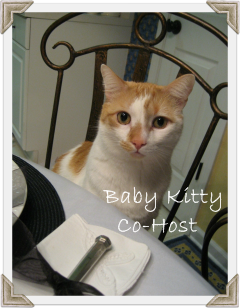 Love the masks, the napkins, the added touches and adore those sweet, silly kitties! I love your tablescape! I came to Tablescape Thursday hoping to find some inspiration for a Mardi Gras themed setting...Thank you for providing exactly what I was hoping to find!!!! You are just so clever! Your tablescape is fantastic! 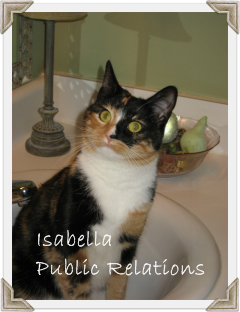 Baby Kitty & Isabella are too adorable. How did you ever get them to hold still long enough to take a picture? I say this every time, but I really do think this is your best tablescape yet. And that is saying something because they have all been wonderful. Once again, the perfect music to set the tone. The masks are beautiful and you are so right the harlequin necklace is much more sophisticated than those ordinary Mardi Gras beads. 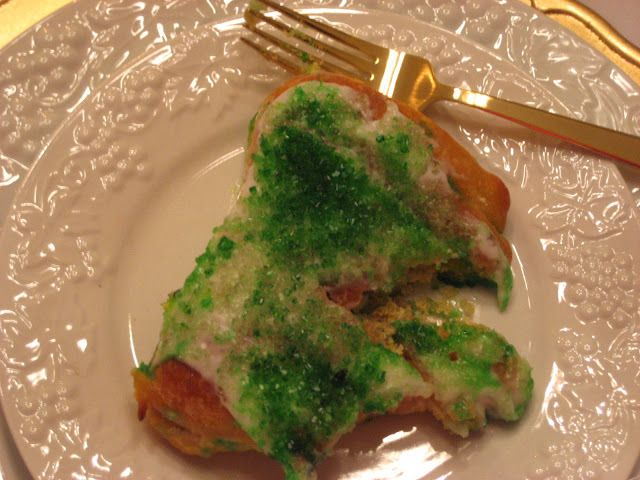 I have a girlfriend who bakes us a king cake each year. I had never heard of them until she brought the first one to us. Hi Debbie,a beautiful table indeed.When I was looking at it I was thinking,how talented you and the others I visit are at setting a table.I have never did much except on the big holidays but you tablescapers are starting to get to me.My poor man is just happy if there is food on the table.So pretty,festive,bravo! How festive! It definitely feels like MardeGras. If your party is half as fun as your tablescape, you're sure to have a fabulous time. Oh my goodness Debbie I love to visit your TT posts! You are really inventive and create such beauty for us to see each week. I always enjoy the kitties and your musical themes that match. We all need to give YOU an award or the title of tablescape "Queen" along with Susan! Better to buy the next King cake than like one chef I heard say, "if you got the baby you also got the cleanup detail". You certainly set the right mood here. "It's Party Time". I had always wondered why the colors of purple, green, and gold were used. Thanks for explaining the meaning. I liked your masterful touch of using the beads around the candle for your centerpiece. The layered napkins look perfect. You have set a beautiful table. What a wonderful idea. I love the beads in the glass vase. Your table is vibrant with colors...and it all goes together so well! Your post made me want to go to N'awlins! Wow, what a great table, girl...when's the party? whoppin' and hollerin' , here I come! Wowzers! Debbie, you just outdid yourself today! That is so stunning, so gorgeous!! The last pic has me just laughing so loud. Adorable. Hi Debbie, I just had to look at your tablescape again...planning to copy it Tuesday for our little family Mardi Gras dinner. Also, in answer to your question, yes, chocolate gravy is basically just chocolate sauce: cocoa, sugar, cornstarch, and milk...that's all. The magic happens in the pot. I think that by calling it gravy the nutrient content is raised thereby qualifying it for part of the meal and not just dessert or snack time. Anyway, that logic works for me. Thanks for coming to visit me. I love your table! 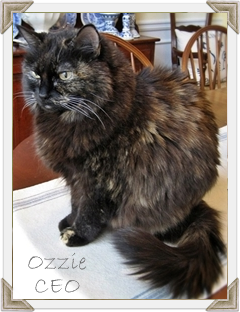 Your cats are adorable! Debbie, I love it!!!! 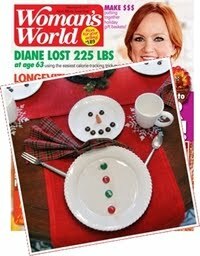 What a fun and creative tablescape!!! Your kitties are party animals! 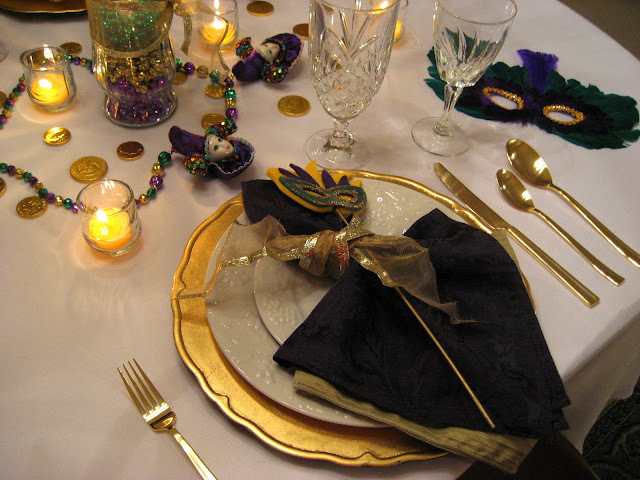 Girlfriend, this is one of the prettiest "Mardi Gras" tablescapes I've ever seen! I just love the rich gold, purple, and green colors!!! 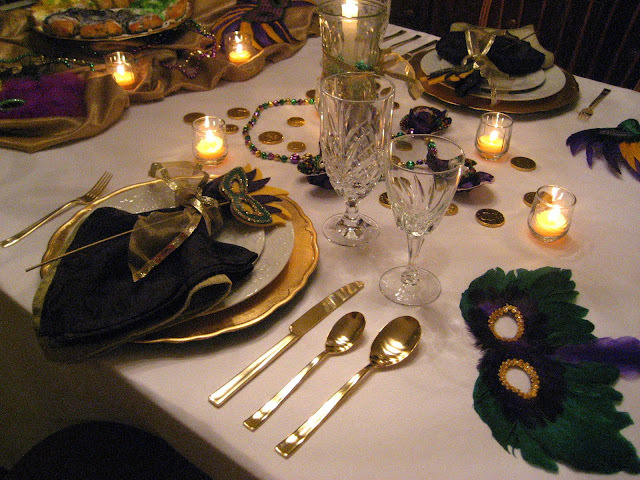 Your tablesettings are simply gorgeous...the pretty gold charger with the white plates...ahhh! And I love how you did your napkins...those little mask picks are awesome!!! 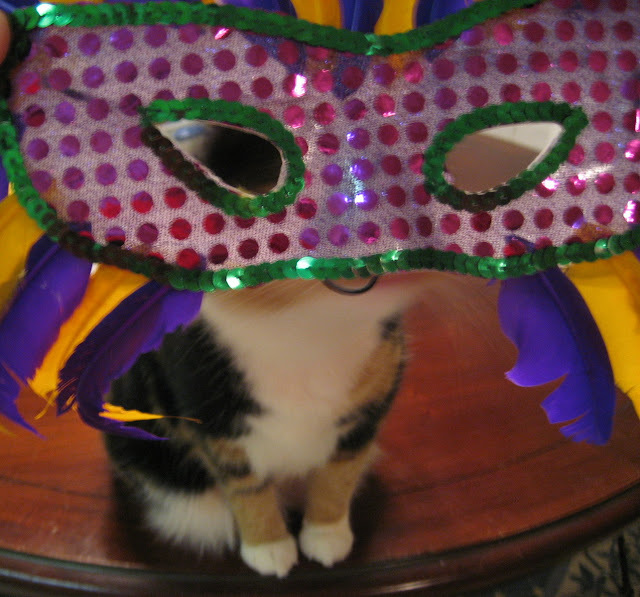 Ohhh, and speaking of masks...love the pretty colorful masks...especially on your kitties!!! Girl, I just adore your "side-kicks"...wished you could hear me giggle and see me shake my head whenever I read your posts!!! They're adorable!!! 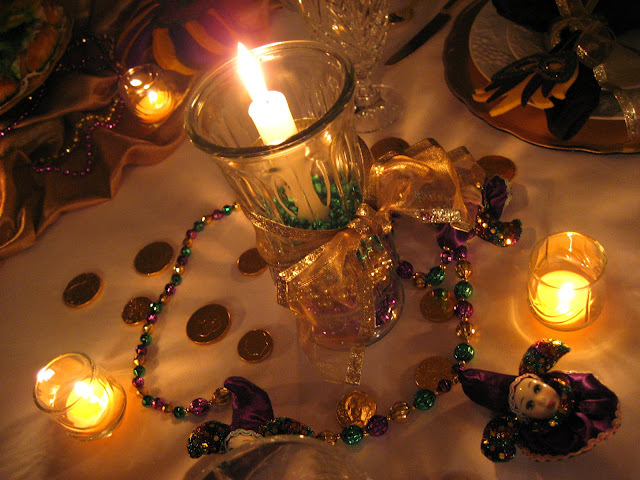 Well my friend...you have set the perfect festive table for Mardi Gras!!! What time is the party? I want a piece of the king's cake!!! Oh yes, and a few of those gold covered chocolate coins too...hehe!!! FUN-FUN-FUN!!!! Oh my goodness, I love the colors! 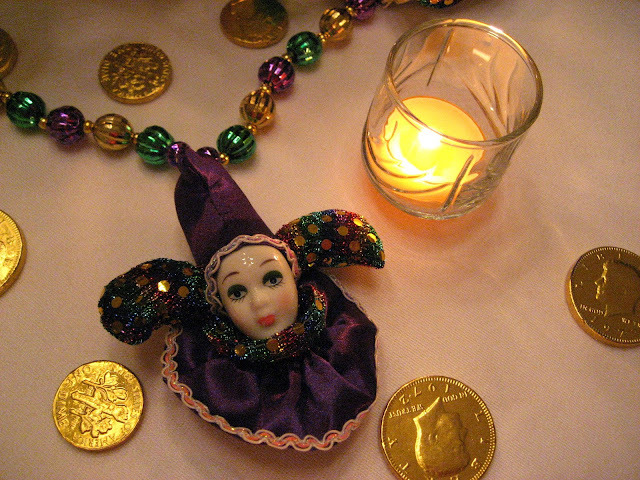 Beads to hold the candle - chocolate coins-colorful napkins & masks! Love it all!!! This was a feast for the eyes! Love it! This is spectacular! Very creative and such fun! 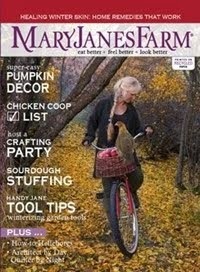 I love the idea of incorporating the masks (and the kitty was awfully cute too!) into the tablescape. The beads in the hurricane were fun. The harlequin necklace added to the festivities. I want to come to your party! So festive. I just love the King's cake. I actually got the baby one time! What an elegant tablescape. Well done. And I love the kitty behind the mask. GREAT Mardi Gras celebration! The masked cats are CLASSIC! 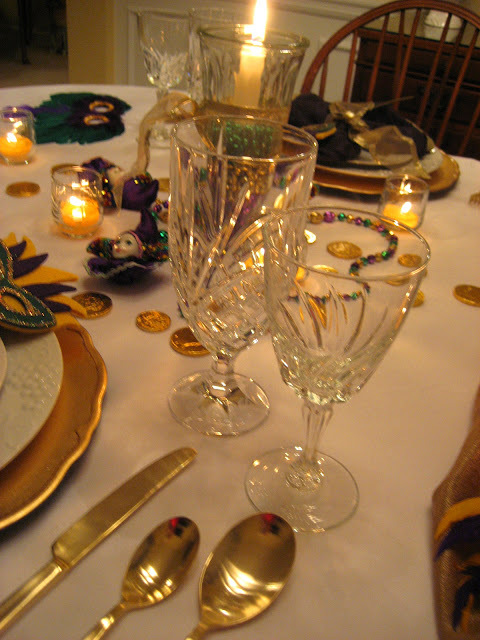 Great Mardi Gras table :-) I am from Louisiana but live in Washington state. 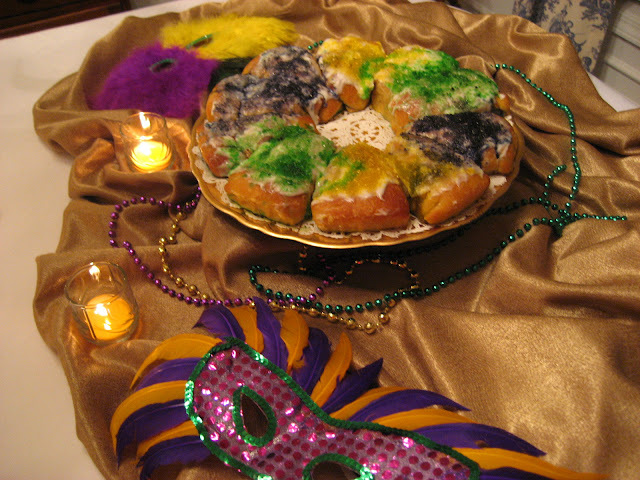 I like to do some kind of Mardi Gras celebration every year just as an homage to home! Great inspiration you've posted her..thanks! Debbie, this table just sparkles with the candlelight flickering on all of those metalic colors. The candle with the beads around it is brilliant! I cannot believe you got those cute picks at Kroger! I'm going to have to check to see if our K has some. Your masks are beautiful! Are the cats really wearing them, or is that some fancy photography trick? 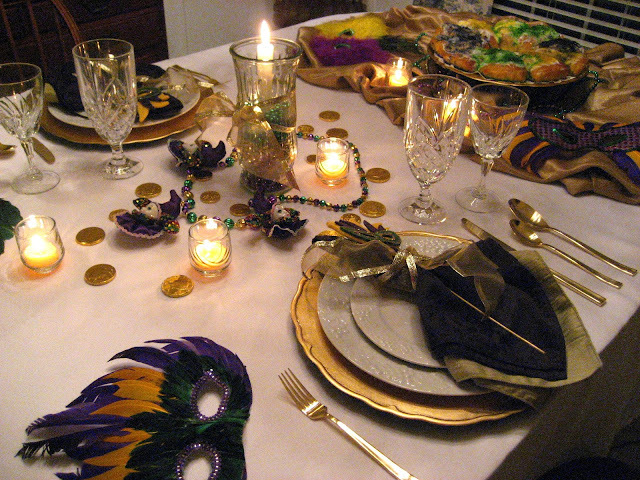 This is just a wonderful and festive Mardi Gras table, and I love it! What a great table! I have never been a big Mardi Gras fan; I guess I don't understand it that much . . . So Cal and all that. But looking at your table makes me want to party!!!! Ok, so now I'm going to go google Mardi Gras and find out what it really truly is all about. Duh! Oh my goodness, the cats are so funny!! I tell you they really know how to party, I love it. You have such a festive tablescape. Hi, Debbie! Happy Mardi Gras from Mobile, AL where Mardi Gras orginated! Moonpies are the only thing you're missing. I used to parade with a ladies organization on Mardi Gras day and believe me, it was a ton of fun! Let the good times roll! Throw me something, mister! Your tablescape is a good time waitin' to happen! What a cool idea! Your cat is great! Love the beads! Fabulous tablescape! Love the Mardi Gras theme! How in the world did you get Baby Kitty to wear the mask and not eat it?! Oh, I know you had fun setting this table! You have it all down to the smallest touch. The coins! 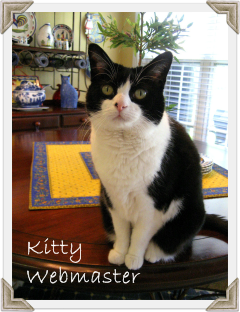 the mask, the to color napkins, I love kitty, wonder who behind that mask! lol Thanks for the French story, I had forgotten about finding the baby, and being King or Queen for the day! How I know this? Did read a lot, plus I always wanted to speak French, I sang in French two songs to my girls, and now to my grandchildren as I rock them. It always the songs they fall a sleep by. Love your table!!! 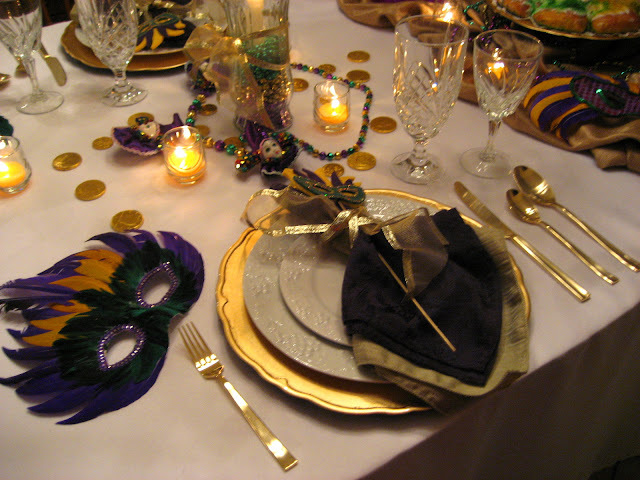 I featured your Mardi Gras table as a part of of our Centerpiece of the Month.